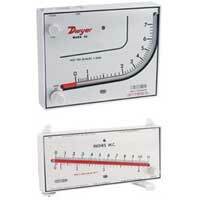 These inexpensive manometers measure positive, negative and differential pressures. 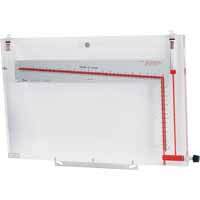 Dwyer® Flex-Tube® U-Tube Manometers combine the inherent accuracy of the simple "U" Tube with the durability of tough, long-lasting plastic construction. Columns are of .375" O.D. 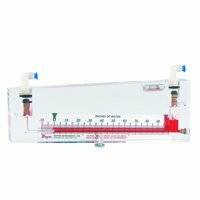 flexible and shatter proof clear butyrate tubing. They are easily accessible for cleaning. Indicating tube is backed by white scale channel to provide maximum color contrast. Scales are extruded high impact polystyrene plastic, formed to hold columns in perfect alignment. Stark white scales have graduations and numbers silkscreen-printed in black for maximum legibility. 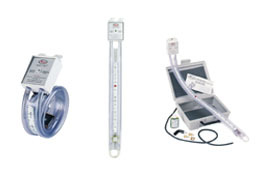 You can choose from numerous models and features including over-pressure safety traps, in full scale ranges from 8" to 36" of water or mercury. All are suitable for total pressures to 100 psi - for determining velocity and static pressures, leakage, fan and blower efficiency, filter resistance, and gas pressures. 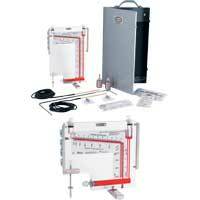 Ideal wherever a portable, direct reading manometer is needed. Standard ranges and markings as shown, or special ranges, colors, logos and brand names for OEM quantity orders are available. Click here, if you require a Material Safety Data Sheet for the Fluorescein Green Concentrate or the Red Gage Fluid. Minor Divisions of 1/10" water column (or 2mm water column on metric units) are silkscreened in jet black on stark white scale for positive definition. Easy to read, even at a distance, they are acrylic coated for permanence. 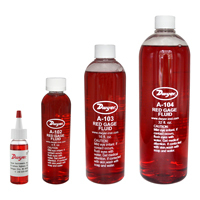 All models are furnished with one 3/4 ounce bottle of fluorescein green color concentrate with special wetting agent for W/M models, or 3/4 ounce bottle of red gage fluid for "D" units. 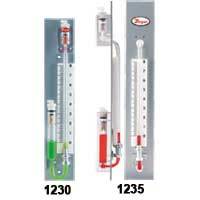 Series 1221 Manometer - Our simplest, lowest cost basic U-gage. 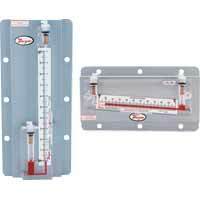 A dependable U-tube manometer that withstands hard use and provides accurate, high visibility readings. For use with water, mercury or red gage fluid. 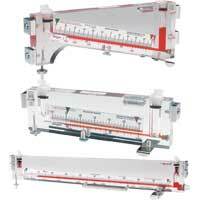 For mercury filled manometers, a scale clamp bar, Dwyer® Part No. A-363 (available as an extra for Series 1221 - and standard on Series 1222) is recommended. One pair of carrying plugs and a pair of non-kink vinyl tube connectors are included with each manometer. 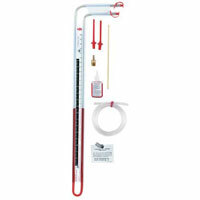 Series 1222 Manometer - All the features of the 1221 plus magnetic clips for mounting to any vertical steel surface, and clamp bar to insure against U-tube slipping. (Especially recommended for manometers used with mercury.) Both magnets are easily removed and replaced at the user's convenience. 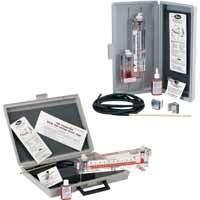 Series 1223 Manometer - Our finest U-gage - for either portable or stationary use. Safety traps prevent loss of indicating fluid in case of accidental over-pressure. Tubing is permanently bonded to a molded, high impact acrylic plastic top that contains safety traps. Large magnetic clips and clamp bar are provided. Standard type "a" connections include two rapid shut-off type molded nylon tubing connections, two 3' lengths of flexible Tygon® plastic tubing, and two 1/8" pipe thread to tube adapters. 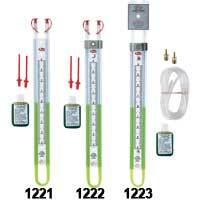 EXAMPLE 1221 8 W/M AT Series 1221-8-W/M-AT U-Tube Manometer, range 4-0-4" w.c. using water/mercury, with aluminum tag. Model 1212. How much fluid mixture is required? What is the best method to fill this unit? A 1 oz bottle of A-126 Fluorescein green color concentrate is added to a quart of distilled water. Remove a tubing connector from the manometer and pour the mixture in to mid-point level. Shake the manometer to remove air bubbles and slide the scale so the zero mark is in line with the meniscus of the two fluid columns.